1.) K&Company Black Smash Stick- Used for art journaling and writing on snail mail envelopes. The glue on this thing works exceptionally well, too! 2.) Dong-A Anyball Ballpoint Pen (0.7 mm)- I recently purchased this on my summer Korea trip as an "everyday purse pen." I like the comfortable rubber grip and how smooth it writes. Retractable pens are my favorite as I find them the most convenient when traveling. 3.) Pilot Hi-Tec-C Maica Gel Pen (0.4 mm)- This pen was also purchased in Korea, and what attracted me to it was the fine tip for those tight writing spaces and thin lines. I find myself using this pen more with the hobonichi and midori grid paper. 4.) Pilot Precise V5 Stick Rolling Ball Pen (Extra Fine)- A coworker of mine would always use these pens for marking notes in contracts and reports, so one day I asked if I could "borrow" her pen to jot something down real quick. I loved how light and precise (hence the name) it felt. Went out and bought my own pack that night. These pens are used as my work pens now, as I call them, and are used to circle or point out things in reports we run, such as updates, errors, discrepancies, changes, etc. 5.) Pilot BeGreen Bottle 2 Pen- This pen was the beau's but somehow ended up in my collection after we moved. It's pretty cool that it's made from a recycled plastic bottle. And for a gel pen, the ink is practically smear-proof and dries almost instantly. 6.) Delfonics Ballpoint Pen- This was given as a gift, and I love it. 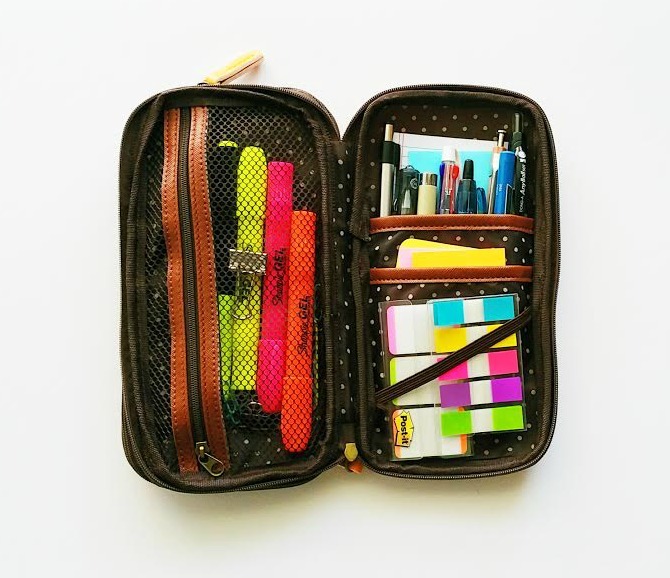 The wood body and lightweight feel make this the perfect travel companion for my midori notebook. They just look so well together. 8.) Sakura Pigma Micron Pen (size 01= 0.25 mm)- My crafting pen I use on textured or crafting paper. 9.) Java Jet 3 Ball Pen- This was purchased in Korea, too. I got it because I realized that I didn't own a 3-color multi pen. So now I do. 10.) Highlighter- Adding a bit of neon will just about catch anyone's attention, so I use this for everything- highlighting reminders, highlighting appointment times, special events, birthdays, etc. 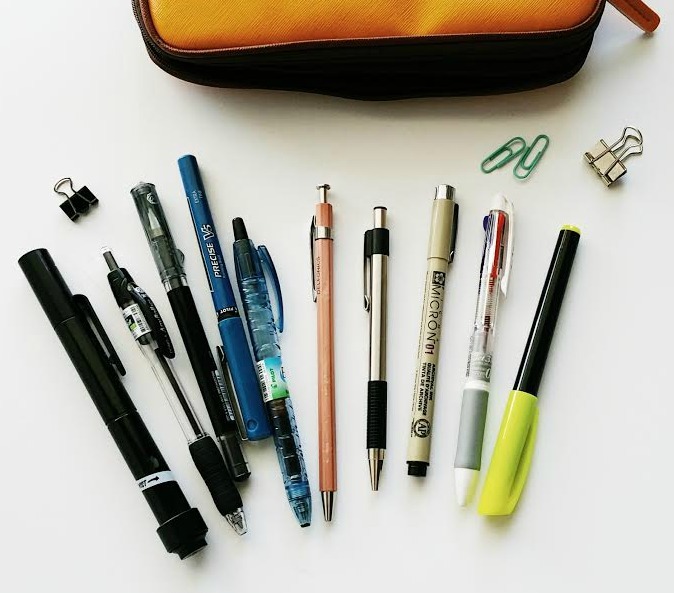 I'd love to know what are some of your favorite writing utensils! Those pens are nice, too! I'll have to try one as soon as my other ones run out. 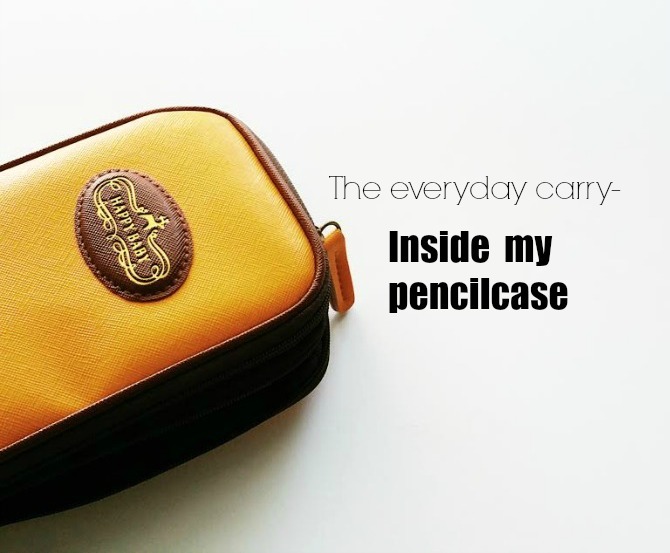 I don't have pencil case. Just mug with pencils and others. The good ol' mug works as well! That's what I used for years. 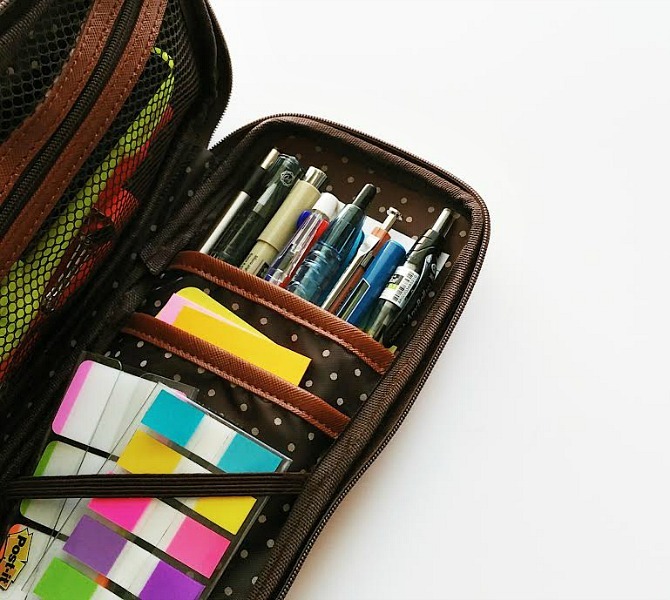 I use the pencil case mainly when I'm on the go. The Delfonics Ballpoint Pen just looks so inviting! I almost miss writing with a regular pencil, as you don't get the wood feel with pens or mechanical pencils, and this one you have just looks divine! Sometimes I miss writing with a pencil as well. But for some reason, over the past few years, I've grown to love pens more just for the thought my writings being permanent. You'll have to try the delfonics pen. I'm sure you'll like it! What a handy pen! And it came with an eraser? When I was in Korea, there were sooo many style and options to choose from, I wanted to buy them all. I just couldn't choose. And I did come across the ones that had the multi colors, but yes, a few of them would jam up or not write as smooth.